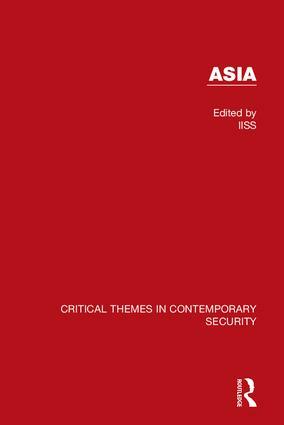 Asia: Critical Themes in Contemporary Security is new four volume collection featuring the key articles on the region published in Survival, the International Institute for Strategic Studies’ bi-monthly journal, one of the world’s leading forums for analysis and debate of international and strategic affairs. Covering both East Asia and South Asia this is an ambitious and wide-ranging collection, covering a vast region of pivotal importance that continues to be a theatre for the power-plays of grand strategy. Articles by key and influential figures including, Coral Bell, Robert Scalpino and Robert Zoelllick, explore the shifts in the global order, including anxiety about the role of the United States and the rise of China, look at resources and energy supply in the region as well as nuclear weapons and the arms race. Including an introduction and a full index, this collection will provide provocative, thoughtful and expert insight for both the student and scholar alike.